RE169: The best news and photography! • News: First confirms that freight subsidiary GBRf is up for sale. The new Liberal-Conservative coalition Government get off to a good start with pro-rail announcements. South West Trains’ Etches Park North ‘Meridian’ depot opens at Derby, while Alstom and Virgin team up for a new West Coast maintenance facility at Liverpool Edge Hill. Summer locomotive-hauled trains return to Weymouth and Great Yarmouth. London Overground re-opens the East London Line after a two-year rebuild. • News in pictures: A ‘Western’ and Class 40 team up for a railtour to Penzance. An ETH Class 37/4 returns to sleeper duty. The ‘Pretendalino’ goes diesel for a day. DPS celebrates 50 years of Finsbury Park with a white-stripe Class 31. • Follow-up: We covered the story of Fastline Freight and its demise due to the financial collapse of parent company Jarvis in the last issue. Here, Andrew Cardle, Managing Director of the company when the end came, responds to that feature, setting out why the company ultimately failed, and remonstrates that there are too many barriers put in the way of smaller, new freight operators. • Pictorial: Half of the Class 87 fleet is now in Bulgaria working for private freight operator BZK. With PTG having just completed a three-day tour of the Balkan country, we present a portfolio of images of these former WCML stalwarts now in traffic on the other side of Europe. • Feature: When British Rail’s container business was privatised in the mid-1990s, the new owners adopted the company’s original red triangle logo to replace the Railfreight Distribution diamonds worn by most of the rest of its fleet of Class 47s and two types of electric locomotive. Simon Bendall provides a history of the minimalist livery, which used Roundel’s triple-grey Railfreight scheme as a base. • Railtours: One of the new GE ‘Powerhaul’ machines debuts on a Pathfinder railtour, hauling the train from Crewe to Carnforth and Leeds with a Hatfield & Stainforth ‘mini tour’. With a pair of mini-specials taking in two Norfolk seaside resorts, Spitfire’s latest tour could have seen problems. Read on for how it worked out. • Preservation: The GWR175 event at the G-WR will see the unique Brown, Boveri & Cie ‘Kerosene Castle’ prototype 18000 on display. The return to service of ‘Hoover’ Indomitable will now take place in 2011 as problems mount up. • Time Traveller: Four decades ago, the rail link to the Isle of Anglesey – Stephenson’s famous Britannia ‘Tubular’ Bridge – was severed after a fire ravaged the Victorian era structure. • Modelling: The last few weeks have seen a mad dash by retailers to link up with manufacturers to produce any remaining locomotives not already claimed – we report on news of 4mm scale Classes 76 & 77, the ‘Blue Pullman’ and LMS/EE ‘twins’ Nos. 10000 & 10001. There are pre-production images of our new limited edition Class 03 diesel shunters and Bachmann’s Class 70 loco.We review Dapol’s ‘N’ Class 58 and ‘Silver Bullet’, as well as the ‘OO’ KQA ‘Pocket’ container wagon, and Bachmann’s 4mm scale MBA. David Ratcliffe describes whisky traffic in a modeller’s guide, while Chris Ibbotson builds up a Bratchell Class 455/9 EMU. On sale via subscription and specialist distribution (May 28th) or from your local newsagent (June 1st). This entry was posted on Friday, May 28th, 2010 at 11:13 am and is filed under Latest issue. You can follow any responses to this entry through the RSS 2.0 feed. You can leave a response, or trackback from your own site. 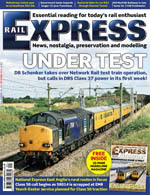 New issue looks great,have u found out the info regarding 70007-12 being built at present. 21/06/2010 Just 57604 in GWR Lined green at Paddington this morning immaculately turned out, just to drag the sleeper to the Oak. Will there be some decent photo’s in the next issue?